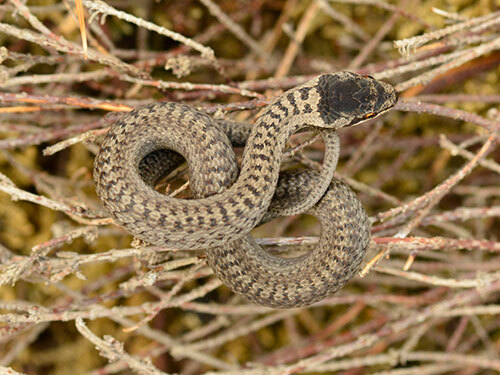 The Smooth Snake is Britain’s rarest and most secretive reptile, now found naturally on heathlands in Dorset, Hampshire and only a very few sites in Surrey. Many of the sites on which it occurs are also inhabited by the sand lizard. 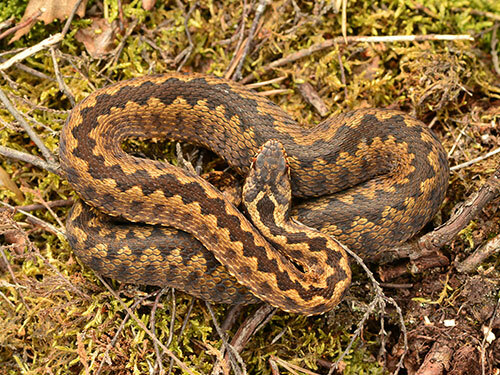 The Smooth Snake is dependent on well managed heathland, where it is mainly found in mature vegetation that provides good cover. On these sites it can use a range of habitats, from dry slopes to humid and wet heath areas. 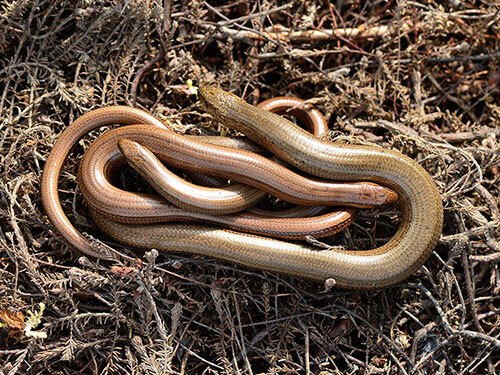 The Smooth Snake shares the Slow-worm’s habit of hiding under stones, logs and other debris exposed to the sun, rarely basking in the open. This species is very difficult to detect, so a site for reintroduction has to be surveyed for several years before its absence can be proven beyond reasonable doubt. Reintroductions are done by translocations of wild animals from other sites. This has meant that far fewer re-introductions have been done than with the Sand Lizard which can be bred in captivity successfully. 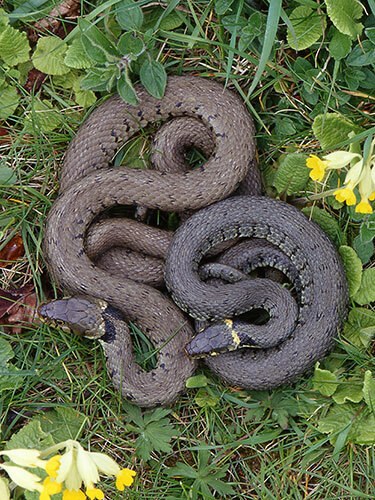 To date, Smooth Snakes have been reintroduced to sites in Surrey, West Sussex and Devon. The West Sussex population was reintroduced in 1997 to a site which had been part of a population on the larger well connected heathlands of the past. I am pleased to report that from the original thirteen individuals translocated from Dorset 21 years ago over thirty individuals during recent surveys have been identified including neonates (juveniles) in most years. They have also crossed a minor road to populate another adjacent heathland. Smooth Snakes are smaller and more slender than other snakes, usually only growing to 60-70cm in length. They are generally grey or a dull brown colour with black markings arranged in bars or two rows of dots down the back. Smooth Snakes nearly always possess a heart-shaped “crown” marking, which covers the top of the head. An eye stripe is usually present, extending from the eyes along the side of the head. The Smooth Snake’s name comes from the fact that its scales are flat and smooth, unlike those of the Grass Snake and Adder which have a ridge (or ’keel’) down the middle. 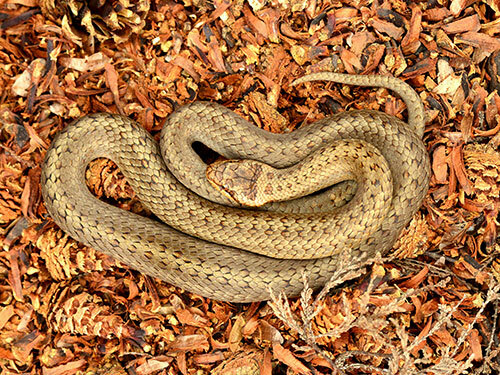 Smooth Snakes usually emerge from hibernation in April-early May. They are non-venomous and feed mainly on Common Lizards, Slow-worms and small mammals (especially shrews and nestling rodents), which are captured and constricted in the coils of its body. Live young, which look very similar to the adults, are born in September. Smooth Snakes are long-lived and females tend not to breed every year. The Smooth Snake is a secretive animal and when it basks in the sun it does so entwined amongst the stems of heather plants, where it is superbly camouflaged. Due to its rarity, the Smooth Snake is strictly protected by British and European law which makes it an offence to kill, injure, capture or disturb them; damage or destroy their habitat; or to possess or trade in them. A licence is required for some activities involving this species. Any snake sightings are much welcomed as all our snakes seem to be struggling in the wider countryside. Pictures of them are appreciated and especially for ID of Smooth Snake. Either enter your records on the iRecord website or send them directly to Bob Foreman at the SxBRC.